Here is the list of the hotels near Pompignac. Book your hotel near Pompignac today, Monday 13 May for the best price, reservation and cancellation free of charge thanks to our partner Booking.com, leader in on-line hotels reservation. Below here is the list the 50 closest hotels of Pompignac, sortable according your criteria. You will find the position of these accommodations on the Pompignac hotels map. 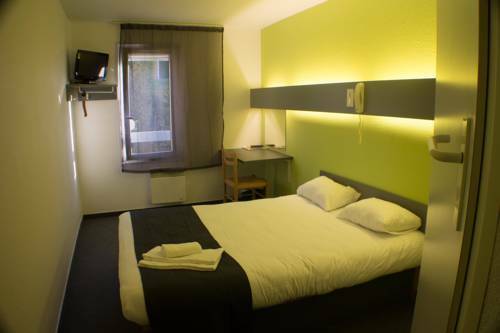 Situated in Lormont, ibis budget Bordeaux Est Lormont provides free WiFi. Boasting luggage storage space, this property also provides guests with a sun terrace. The rooms are equipped with a flat-screen TV with satellite channels. At the hotel, every room has a wardrobe. Rooms include a private bathroom. Guests at ibis budget Bordeaux Est Lormont can enjoy a buffet breakfast. Bordeaux is 12 km from the accommodation. The nearest airport is Mérignac Airport, 20 km from ibis budget Bordeaux Est Lormont. Located in Lormont, this Premiere Classe Hotel is a 15-minute drive from central Bordeaux and a 10-minute drive from Atlantique Matmut Stadium. It is easily accessible by the A10 motorway and offers free secure parking. The air-conditioned guest rooms at the Premiere Classe Bordeaux Est Lormont are equipped with a private bathroom. They also have a TV and free Wi-Fi access. A buffet breakfast is available every day and vending machines are at your disposal for drinks and snacks. Guests can discover the Gironde region and its renowned vineyards. Set in Carbon-Blanc, Maison (villa) de charme avec piscine offers accommodation with a terrace and free WiFi. The holiday home features pool views and is 13 km from Bordeaux. The holiday home consists of 4 separate bedrooms, 2 bathrooms and a living room. There is a dining area and a kitchen complete with a dishwasher, an oven and a microwave. Saint-Émilion is 36 km from the holiday home, while Mérignac is 18 km away. The nearest airport is Mérignac Airport, 21 km from the property. Guest accommodation Carbon-Blanc Preferred hotel ! Set in Carbon-Blanc, Maison d'hôtes L'Echoppe & Les Toiles offers a casino. Boasting an ATM, this property also provides guests with a children's playground. The property provides a shared lounge. All units in the guest house are equipped with a flat-screen TV. Featuring a private bathroom, rooms at L'Echoppe & Les Toiles also provide guests with free WiFi. All rooms will provide guests with a microwave. Guests at the accommodation will be able to enjoy activities in and around Carbon-Blanc, like cycling. Bordeaux is 13 km from Maison d'hôtes L'Echoppe & Les Toiles. Mérignac Airport is 21 km from the property. On the outskirts of Bordeaux, Hotel & Restaurant Le Juliano is located in the village of Carbon Blanc, close to the A10 motorway. Rooms at Hotel Le Juliano are modern and offer flat-screen TVs and free Wi-Fi internet access. The hotel offers a restaurant serving French dishes. Hotel Le Juliano is the perfect choice to explore Bordeaux and its surroundings for a reasonable price. HotelF1 Bordeaux Nord Lormont offers accommodation in Lormont. The hotel is located 500 metres from a tram stop servicing Bordeaux city centre. Matmut Atlantique Stadium and Bordeaux Exhibition Centre are located a 10 minutes' away. Each room has a TV and a sink as well as access to a shared bathroom. Guests can enjoy the on-site restaurant. Guests can purchase microfibre towels at the hotel at an extra cost of EUR 3 each. Bordeaux is 7 km from HotelF1 Bordeaux Nord Lormont, while Saint-Émilion is 28 km from the property. The nearest airport is Mérignac Airport, 16 km from the property. Boasting air-conditioned accommodation with a terrace, Bellevue is located in Carbon-Blanc. Guests are welcome to enjoy the free WiFi. The apartment is fitted with 1 bedroom, a TV and a fully equipped kitchenette that provides guests with a microwave. Bordeaux is 11 km from the apartment, while Saint-Émilion is 36 km away. The nearest airport is Mérignac Airport, 19 km from the property. Featuring air conditioning, Study Hôtel is located in Lormont, just in front of the Carriet Tram Stop. The property is 7 km from Bordeaux. Saint-Émilion is 29 km away. Free WiFi is featured. All units feature a flat-screen TV. There is also a kitchenette, equipped with a microwave, refrigerator and stovetop. Every unit is fitted with a private bathroom with a shower. Bed linen is offered. Study Hôtel also includes a terrace. Mérignac is 11 km from Study Hôtel, while Pessac is 12 km from the property. Bordeaux Saint Jean train station is 15 km from the property. The nearest airport is Mérignac Airport, 15 km from the property. Below here is the hotels map of Pompignac. Names and details of Pompignac hotels can be shown on the map clicking on the prices icons.